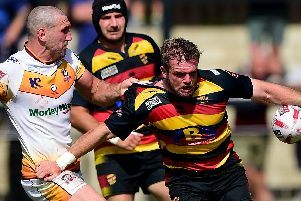 Doncaster Knights’ battle against relegation from the Greene King IPA Championship could be won this weekend. A bonus-point victory for Knights at home to Nottingham tomorrow and Plymouth Albion returning empty-handed from Cornish Pirates on Sunday would see Clive Griffiths’ men 16 points clear of the Devon club with just three games remaining. Even if things don’t go their way this weekend, Knights would remain well-placed with Albion having to face leaders Bristol in their run-in as well as second-bottom Moseley. Although keen not to look too far ahead, Griffiths is certainly confident that Knights’ Championship status will have been resolved by the time that they visit Brickfields in their last game of the season. “That was the aim at the start of the season after winning promotion back to the Championship and we are close to achieving it,” said the Welshman. Knights are unbeaten in their last four Championship games – their best sequence since returning to the second tier of English rugby – and their recent form is in stark contrast to that of the Greens, who had lost their previous five league games prior to beating Moseley last weekend. That result helped them climb into fourth spot but they will need to play better in their final four games to retain the final play-off berth. Griffiths was rightly critical of a poor display at Meadow Lane in December, but given the fact that Nottingham have won just once on their travels in 2015, he is confident Knights can gain revenge.